The Green Line of Via Dinarica enters from Slovenia into Croatia at the border crossing point Brod na Kupi. 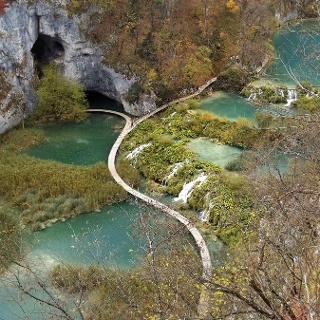 We begin our tour by exploring one of the most picturesque canyons in Croatia – Vražji prolaz ("Devil's Passage") – and then we proceed with a climb to Skrad. 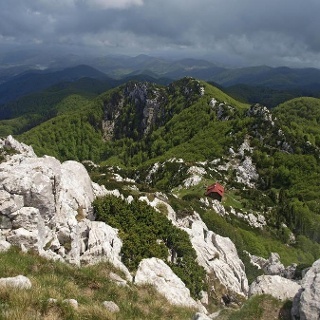 Since ancient times, the area of Skrad has represented the tourist and mountaineering heart of Gorski kotar. 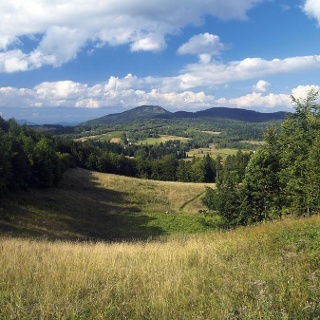 There is no settlement in the region of Gorski kotar as tied to mountains as this place. This settlement is located on a steep slope of Skradski vrh, on the main road and railway link between Zagreb and Rijeka. Opposite to Skradski vrh, below Skrad, hidden in the bottom of a natural depression 300 meters deep, lies Vražji prolaz – one of the most beautiful natural phenomena of Gorski kotar and Croatia. Its most attractive part is the narrow canyon of the creek of Jasle. Not far from Vražji prolaz, we see an equally impressive cascade of the creek of Curak diving in front of the magnificent cave portal of Zeleni vir ("Green Whirlpool"). Roaring watercourses and pleasant forest shade give a unique character to the ambiance. The area around the narrow valley below Skrad, where we come across Zeleni vir and Vražji prolaz, is protected as a geomorphological reserve. From the settlement of Brod na Kupi, we first briefly hike along the road towards Delnice. At the village of Iševnica, we turn from the main road to a side road leading upstream along the small river of Iševnica, and proceed to Donji Ložac. The route takes us right along the right bank of the Iševnica, ending at the access road from the direction of Skrad, close to the excursion facility Zeleni vir. This is where the creeks of Curak and Jasle meet, creating the river of Iševnica at their confluence. To the left, we can reach the impressive portal of Zeleni vir and the waterfall of the creek of Curak in 20 minutes of hiking. To the right, there is an attractive trail through the narrow rocky canyon called Vražji prolaz. Both of these route options are marked by hiking trail markings, and they end in Skrad. Unfortunately the Planinarski Dom at Zeleni Vir was closed (on a Friday mid September). Great location though! Planinarski Dom Skrad in Šubetov Most is a nice, comfortable place to stay, a bit off trail, but worth the detour if you're in need for a warm shower. With good weather I would suggest to continue with the next stage. Just below Skradski Vrh Near the church is a great bivy spot. There's a small grocery store in Brod na Kupi and in Skrad.